Archive of 1998 PNC Info. 12/18/98 - Scott Publishing has announced the following assignments of catalog numbers for coil stamps. ** 3266 - H Self-Adhesive with oversize backing paper and separation between the stamps. 12/15/98 - Robert Starkey, the philatelic clerk in Providence, RI, reports that he has in stock, plate #111 on the 5c Wetlands Self-Adhesive coil of 3000 and 10,000. Both have Blue back numbers every 20 stamps. Both the 3000 and 10,000 coils are available with Bottom numbers, and the 3k coil is also in stock with Top back numbers. Bob commented that there seems to be a difference in color on the two coils. The 3k is bluer and resembles the Lick n Stick version. The 10k has a more blue/gray color to it. Bob also has the 10c Eagle & Shield, in both Self-Adhesive and Lick n Stick coils of 10,000. The S/A version has a Blue Bottom back number every 20 stamps, while the lick variety has no back numbers. See item below dated 11/19 for links to data. 12/15/98 - Renate Fearonce, the philatelic clerk in Tucson, AZ, reports that she has in stock, plate #111 on the 5c Wetlands Self-Adhesive coil of 3000 and 10,000. Both have Blue back numbers every 20 stamps. The 3000 coil is available with Top and Bottom numbers, while the 10,000 coil is on hand with only Top numbers. Also in stock is the 10c Eagle & Shield, in both Self-Adhesive and Lick n Stick coils of 10,000. The S/A version has a Blue Top back number every 20 stamps, while the lick variety has no back numbers. 12/15/98 - A new plate number on the 10c Self-Adhesive Bicycle has been confirmed. The newest number is 344 from a coil of 3000. 12/12/98 - The USPS released advance publicity images of two coil stamps that will be issued in 1999. A 33c Flag Over City will be issued on February 25 and a 33c Berries strip of 4 will be released sometime in March. Both issues are self-adhesive, while the Flag will also be available in lick n stick. The Berries stamps will feature four different berries: blueberries, strawberries, raspberries and blackberries. Also announced was a Pink Coral Rose, which is to replace the Yellow Rose. The publicity release did not indicate that this would be in coil format. More information as it is released. 11/19/98 - The USPS announced today in Postal Bulletin 21985 that several coil versions of previously released stamps will be issued December 14th. The new stamps will include: A 5c Wetlands self-adhesive coil of 3000 and 10,000; plus a 10,000 10c Eagle and Shield coil in both self-adhesive and lick n stick versions. The Postal Bulletin also contains info reconfirming that Nondenominated postage stamps, except for those that bear rate markings (First-Class Presort, Bulk Rate, or Nonprofit Organization) can be used for international mail. This will include the recently issued "H" rate stamps. 11/14/98 - Many Post Offices that were surveyed indicated that they do not have the "H" stamps in stock yet and will probably wait until after Christmas to sell them. A complete list of all known "H" coil numbers and where to get them can be found here. 11/9/98 - stamps released today at Troy, NY include the 33c "H" (Uncle Sam's Hat), in lick n stick coils of 100 and 3000 and self-adhesive coils of 100 and 3000 , plus a 22c Uncle Sam stamp. 11/8/98 - Scott Publishing Co. has assigned Scott #3228 to the (10c) Non-denominated Green Bicycle self-adhesive coil stamp. A number has been reserved, but not yet assigned, for the water-activated version. 11/2/98 - A new plate number combination has been found on the BEP version of the 10c Eagle & Shield with water activated gum. The number is 44444 and it comes in coils of 500, and has a lo-gloss gum. 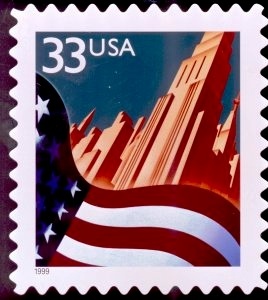 These are apparently the stamps that were reprinted in June, but not the same item that is listed in the Holiday 1998, USA Philatelic catalog as item number 797640. 10/28/98 - Renate Fearonce, the philatelic clerk in Tucson, reports that she has in stock, plate #1111 on the Self-Adhesive coil of 100, 22c Uncle Sam stamp, which will be released November 9th. 10/28/98 - A new plate number on the 5c Circus Wagon has been confirmed. The newest number is #2. 10/26/98 - Two weeks until "H" Day. From several sources we present the reported numbers on the "H" rate coil stamps. ** Lick n Stick coils of 100 - 1111, 3333, 3343 and 3344. ** Self Adhesive coils of 100 - 1111, 1131, 2222 and 3333. ** Lick n Stick coils of 3000 - 1111. ** Self Adhesive coils of 3000 - 1111 with blue bottom back numbers every 20 stamps. These numbers have all been reported by Philatelic clerks who have examined stock at their accountable papers offices and confirmed that these numbers exist. Richard Nazar, publisher of "The Plate Number Coil Catalog", through the use of a "Freedom of Information Act" request, confirmed in the November issue of "Coil Line" that the above plate numbers were employed by BEP to print the "H" coils. 10/11/98 - Two not previously announced coil reprints appear in the "Holiday 1998" edition of USA Philatelic, the catalog of Stamp Fulfillment Services of the USPS. ** A Lick n Stick '$1 Seaplane' coil of 500 reprinted in 1998 - Full Coil @ $500.00 - 770341 and a PNC strip of 5 - 770321. ** A Self-Adhesive 'Eagle & Shield' coil of 10,000 reprinted in 1998 - Full Coil @ $1000.00 - 797640. Several people have reported that attempts to order this item have been unsuccessful, and that the listing probably is in error, although documentation from BEP indicates that a moisture activated Eagle and Shield was reprinted in June of 98. Be aware. 10/11/98 - Renate Fearonce, the philatelic clerk in Tucson, AZ reports that she has the new 3000 coil of the Green Bicycle S/A with plate #333 and blue bottom back numbers. She also has the 25c Diner S/A in a 10K coil with plate #1111 and back numbers. The front and back numbers are spaced so that it takes 420 stamps to get a front/back bullseye. 10/10/98 - A collector reports that he received the new 3000 coil version of the Green Bicycle with plate #333. It came from The Postal Emporium in St. Paul MN 55101. 10/8/98 - The USPS announced today in Postal Bulletin 21982 that several coil versions of the "H" rate stamp will be issued November 9th. The new 33c value stamps in coil format will include: A lick n stick coil of 100 and 3000; plus a self-adhesive coil of 100 and 3000. The Postal Bulletin also contains info on a "Uncle Sam Definitive Stamp" which will be issued the same day in a self-adhesive coil of 100. The value will be 22c, the rate for the second ounce on first class mail. Also announced was an item number (7954) for a self-adhesive coil of 3000 for the Green Bicycle stamp. This version should be available through Kansas City soon. Images and details to follow. 10/4/98 - The "H" coils will be with us soon. Numbers reported so far in coils of 100 are: Self-Adhesive 1131; Lick n Stick 1111, 3333 and 3343. 9/26/98 - A splice was found on a coil of 10,000 of the lick n stick version of the 10c bicycle stamp. The splice, located by yours truly, appears between the counting numbers 01090 and 01100. 9/24/98 - Bob Starkey, the Providence RI Philatelic Clerk reports that he has 'lick n stick' 10c bicycle coils of 500 with Plate # S111 with pink back numbers on the top, middle and bottom positions. He also has coils of 10,000 with pink top back numbers. Bob reports that he also has found a coil of 3000 of the 20c Fire Pumper, plate 9/10. Plate number is every 24 stamps. Order 50 to get a strip with both numbers on the same strip. Bob also has coils of 3000 of the 10c Bulk Rate Auto, plate #S111 every 14 stamps, with black top and bottom back numbers, EVEN. 9/24/98 - The USPS announced today that it will issue a Self Adhesive Diner version on September 30 of the 25c Non-Denominated Diner First Class Presort Coil Stamps. 9/11/98 - Scott Publishing announced that catalog number 3055 has been assigned to the 20c Ring-necked Pheasant self adhesive coil stamp. 9/10/98 - Renate Fearonce, the Philatelic Clerk at Tucson, AZ announced that she has the 10c Green Bicycle Self Adhesive coil with plate number 222. The plate numbers are spaced at intervals of 21 stamps and the back numbers are 20 apart. 420 stamps are needed for a "hit". She has 10K coils with bluish back numbers. Both bottom and top back numbers are available. 9/06/98 - The following coils are available from Indianola PA 15051 as of August 28. FOP L/S 44444; FOP S/A 66666A, 77777A, 78777A; Yellow Rose 5555; Blue Jay S/A S1111; Pheasant S/A 1111. Info from Frank Covey. 8/09/98 - While on vacation, I found FOP 33333A (regular die cut) in Indianapolis, IN and FOP 77777A (regular die cut) in Fort Wayne, IN. Two members reported finding FOP 88888A (regular die cut) in San Jose, CA. 8/09/98 - News from Richard Beecher via Alan Malakoff's USSTAMPS mailing list that "There's a new coil on Page 23 of the Fall '98 USPS SFS catalog. I ordered #794631 - (25c) Self-Adhesive Juke Box from BEP with a plate number every 21 (?) stamps. I received a strip of 25 with #222222 and a light blue back number on top. This appears to be a new number and a new roll size. The catalog says it was reprinted in 5/98." Steve Esrati confirms that the Self-Adhesive coil has spaces between the stamps and that the blue back numbers are 20 stamps apart, while the plate numbers are spaced 21 stamps apart. This stamp is known in dealer stocks. 8/13/98 - The USPS announced today in Postal Bulletin 21978 the issuance on August 14 of a Presorted Standard (Bulk Mail) Green Bicycle Coil Stamp in three formats. The stamp will be issued as a self-adhesive in coils of 10,000 and as a water-activated stamp in coils of 500 and 10,000. Both versions are available from Philatelic Fulfillment in Kansas City and should be in dealer stocks soon. 8/25/98 - Bob Starkey, the Providence RI Philatelic Clerk reports that he has the Green Bicycle Self Adhesive in stock with Plate #221. Bob reports that there are blue back numbers every 20 stamps. 8/27/98 - Bob Starkey, the Providence RI Philatelic Clerk reports that he has the Yellow Rose S/A coil with plate #8888. This cylinder number was reported in these notes on July 12. 7/1/98 - Bob Starkey, the Providence RI Philatelic Clerk reports that he has FOP 77777A in the regular die cut. 7/2/98 - Flag Over Porch #78777A has been located. At this time, the die cut type is not known. It is showing up mixed in with 77777A. If you find either of the new numbers, please let me know so that I can post the information. 7/3/98 - FOP 22222A with reverse (mirror) die cuts was found in the same bubble flat as 66666A with reverse die cuts. They were both found at the Post Rider Station, 201 E High Street, Lexington KY 40507. 7/5/98 - Exclusive from Stephen G. Esrati - "The Disabled American Veterans told me (without realizing it) that we will get a new 2c Locomotive or 2c Red-headed Woodpecker stamp in 1999 when the first-class postage rate goes to 33c. DAV plans to go up to nine stamps per envelope: five 5c stamps and four 2c stamps." 7/6/98 - Addendum to above from Alan Malakoff - "The BEP was told in May that they will be producing the 2 cent locomotive in rolls of 10,000. As Steve said, the F press would be used as the C and D are out of service. However, 'C' and 'D' plates can be used directly on the 'F' without any modification (recent example: Omnibus #3). Because of the length of time since the locomotive was last printed, we may just get a new plate number. And, based on recent experience, probably a different paper (and/or tagging if they decide to tag for the DAV). The locomotive has been previously printed into rolls of 10,000 or larger circa 1990, although they were not available to collectors." 7/12/98 - Rich Nazar reports that a recent visit to the BEP disclosed the following: 32c Yellow Rose coil was on the F press running cylinder combination 8888; 32c Flag Over Porch coil was on the Andreotti press running cylinder combination 88888A. 7/14/98 - Scott Publishing announced catalog numbers for two new coils: (5c) Wetlands - 3207; (25c) Diner - 3208. 7/16/98 - Today the USPS announced in the Bi-weekly Postal Bulletin a new 20c Ring-Necked Pheasant 'Commemorative' Stamp in both Coil and Booklet format. The stamps will be issued July 31 in Somerset, NJ in coils of 100 and sheetlets of 10. 7/22/98 - Flag Over Porch S/A with plate numbers 78777A and 88888A are now being sold by dealers. The copies that I have both have regular die cuts. 7/22/98 - Orders for the new 20c Pheasant coil stamps are now being accepted at Philatelic Fulfillment. Call 1-800-stamp24 and use order #776100 for the coil of 100 and #776161 for a first day cover. 7/30/98 - The 20c Pheasant Coil of 100 to be issued tomorrow is confirmed with Plate #1111 and intervals of 24 stamps between numbers. 6/05/98 - Two new coils issued today. A 5� non-denominated Wetlands Nonprofit Bulk Rate stamp and a 25� non-denominated Diner Presorted First Class stamp. Both issues have pink back numbering. Click on "Wetlands" or "Diner" above to access information page. 6/06/98 - Flag Over Porch S/A with plate numbers 22222A, 44444A, 55555A and 66666A (+77777A - see below) have been found with 2 different die cuts. The normal die cut has a peak to the left at the top and the new-found mirror image has the peak to the right at the top. 6/06/98 - A reliable source indicates that Flag Over Porch S/A #77777A is in the works. The reporter also states that this number will be available in both the regular and mirror die cuts. 6/10/98 - 32� Flag Over Porch S/A #77777A is now available in regular and mirror die cuts. The new 10� Canal Boat #4 has been found with two different tagging types. One is an embedded mottled tag, and the other is a 'smooth' overall tag with a tagging gap. Another back number position has been reported on the 25� Diner - Pink Back Numbers at the Top. The new printing of the 1� Omnibus is Plate #3, not #4 as had been speculated. The gum is lo-gloss. 6/11/98 - A scan of the new mirror image die cut FOP is available for your viewing. Click on the word mirror here. 6/27/98 - Linn's published the US Plate Number Coils 'Trends' list in its' July 6th issue. In that list, the "A" suffix 32� FOP issues are given as Scott #2915A. The 32� Yellow Rose coil is Scott #3054. FOP Tooth varieties (peaks & valleys) are also now listed and priced. 6/27/98 - Scott Publishing announced that the '99 Specialized will contain listings for the 29� Mt. Rushmore 'Toledo Brown' (2523c) and the 32� Ferryboat 'Bronx Blue' (2466b). 6/27/98 - An anonymous poster on the Internet indicated that the USPS will issue the Non-denominated Wetlands and Diner stamps in self-adhesive format at the American First Day Cover Society convention July 31 in New Jersey. 6/28/98 - I now have copies of FOP 22222A, 44444A, 55555A, 66666A and 77777A with the 'mirror' die cuts. See the Photos. 5/15/98 - New numbers reported in dealer's stock - Flag Over Porch Self Adhesive, 66666A / 10c Canal Boat, #4 in coils of 10,000 / 25c Juke Box Self Adhesive #S22222 with back numbering. 5/16/98 - The next PNC report will be in Linn's Trends in the July 6th issue. Flag Over Porch 44444A reported in Tucson and San Jose. FOP 22222A found in Minneapolis. Yellow Rose 7777 located in East Claridon, Ohio, and YR 2222 is in Tucson. Dr. Robert Rabinowitz reports that Flag Over Porch #55555A is being printed by BEP. Robert Starkey, the philatelic clerk at Providence RI sent an updated list of the coils he has available. Request the new list directly from him. Check the philatelic list for his address. 4/23/98 - Flag Over Porch 55555A is available. Reported in New Jersey and advertised by two different dealers. 10c Canal Boat #4 has also surfaced. 4/23/98 - A customer service rep at the cave in Kansas City reports that they are awaiting shipment (before the end of the month) of new printings of the 1c Omnibus (#4? ), the 10c Canal Boat (#4?) and the 25c Juke Box coils (S22222?). 4/25/98 - Flag Over Porch 55555A located in Ecorse, MI 48229. Philatelic Clerk Walter Z. also has 22222A, 44444A and Yellow Rose 6677. Flag Over Porch 11111A and 13231A at Tucson AZ, with 13311A and 33333A at Providence RI. A PNC3 member has found Yellow Rose #6677, 6777, mixed in with coils of 5566 and 5666. These were all in the same bubble packs of 50. The location is in Metro Detroit MI. A PNC3 member has found Yellow Rose #6666 at Evanston, IL. and FOP 11111A at Peoria, IL. Yellow Rose #3334 Reported in a Rumor - Feb 14, 1998. A PNC3 member has confirmed Flag Over Porch #13211A, which has been located in southern California 3/22/98. A PNC3 member has found Yellow Rose #6666 at the Mayfield-Lyndhurst branch in Cleveland OH, 3/22/98. Yellow Rose #7777 Reported in Tucson AZ - Feb 4, 1998 / Found in San Jose, CA Feb 20, 1998 / Reported to PNC3 by a Philatelic Clerk - YR 7777 received in the San Gabriel Valley of Southern California on Feb 19th. Flag Over Porch 11111A, 13231A, 13311A and 33333A found in several locations. / Reported to PNC3 by a Philatelic Clerk - FOP 13231A received in the San Gabriel Valley of Southern California on Feb 19th. / FOP # 22222A announced in Linn's March 9 issue.